Many Americans associate Asian food with the heavy, greasy, fried options available at a typical Chinese or Japanese buffet. Fortunately, if you know what types of food to look for, you can satisfy your Asian food craving without completely breaking your diet plan. If you select the correct variety, sushi can be one of your most nutritious options. Most types of sushi consist of a base or wrap of cold sticky rice. The rice can be topped or filled with many ingredients. Raw fish is the most common such ingredient, but meats, cooked fish, vegetables, seaweed, roe and similar foods can also be used. Sushi can be a nutritious low-fat meal as long as you avoid the varieties that include a few problem ingredients. To help lose weight, you should primarily eat sashimi, a simple sushi that typically is higher in protein and lower in fat and calories than some other varieties. It is typically thin slices of raw fish without the rice or other add-ons, such as spicy mayonnaise, that can add to the calorie count. Also, sushi that is made with brown rice is more difficult to find than the white rice variety, but it is significantly more nutritious. Look for varieties of sushi that are primarily made of lean fish and meats and vegetables, and avoid the ones that contain the more fattening filler ingredients. Tempura is a type of fried sushi that may taste delicious but should usually be avoided due to its high fat content. Some types of sushi, particularly modern rolls like the "Philadelphia," include substantial amounts of cream cheese, which can also be high in fat and calories. The California roll is a popular choice that is generally filled with avocado and crab meat, but its filling is often mixed with fattening mayonnaise. It is also common to flavor sushi -- either before or after it is created -- with soy sauce, which is typically high in sodium. Choose varieties with no soy sauce included, and skip adding your own. If you need the flavor to be able to enjoy your sushi, use a more nutritious low-sodium variety of soy sauce. 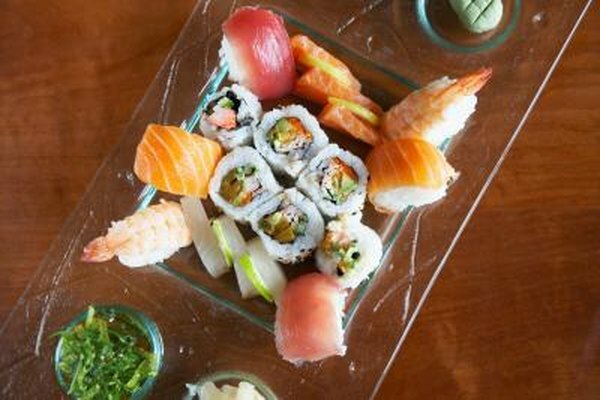 Finest Chef: Is Eating Sushi Good For Your Health? Glamour: Can You Eat Sushi and Still Lose Weight?